This sleak, comfortable, and sturdy can opener by OXO comes in the new i-series design. It's strong manuevering ability opens any jar with minimum effort. The OXO GOOD GRIPS Can Opener makes opening a can easy on your hands. Big cushioned handles give you extra strength to pierce a can, and the oversized knob turns easily. 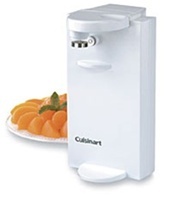 The sharp cutting blade is made of sturdy stainless steel and the soft, comfortable handles absorb pressure. The OXO Good Grips Can Opener also features a built-in bottle cap opener. 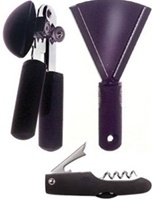 This OXO GOOD GRIPS 3 piece Open Everything Set comes with a Can Opener, Bottle & Jar Opener, and a Waiter's Corkscrew.